Blueberries have great health benefits and flavor. A blueberry packs a lot into a tiny, delicious package. It is not only bursting with flavor, but has exceptional health benefits as well (including antioxidants, vitamin C and fiber). Of course, when it comes to capturing that deliciousness and nutritional value, fresh is always best. But what if you want to save just a little bit of that flavor and nutrition for later use? What are the best ways to preserve blueberries? One way is to freeze them. Place fresh, dry berries on a cookie sheet and pop them in the freezer. After a few hours, take those frozen berries and bag them up in freezer bags. 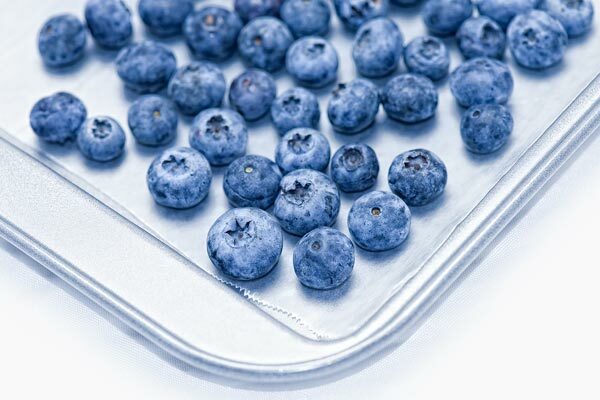 To keep blueberries from sticking together, freeze on a cookie sheet first. By freezing them first in a single layer, you prevent them from sticking together in a big lump. Instead, you end up with a bag of free flowing berries. So when you need a few berries (like for pancakes or waffles), you can reach in freezer and grab just a handful without having to defrost the entire bag! Be sure to label the freezer bag with the date and use them within one year for best flavor and texture. Option two is to make Jam! When blueberries are combined with a delicate balance of spices, their flavor is enhanced. I got the following fabulous recipe from a friend and it is the best blueberry jam I have ever made. There is nothing more delicious on toast or a warm scone in the middle of winter. Give it a try and you won’t be sorry! Sort, wash and remove any stems from the fresh blueberries. Crush the berries in an 8 to 10 quart kettle. Combine the berries, sugar, apple, lemon juice, and spices. Bring the mixture to a full rolling boil and boil hard for 1 minute, stirring constantly. Remove from the heat and stir in the liquid fruit pectin and orange zest. Quickly skim off any foam with a metal spoon (if there is any) and pour hot jam into hot, canning jars leaving 1/4 inch headspace and process 10 minutes in a hot water bath canner. For step by step water bath canning information visit: Water Bath Basics 101. I made this jam today and admittedly, I’ve only made jam and preserves a few times, though I’ve canned other things, so I am not entirely sure what to expect from this. 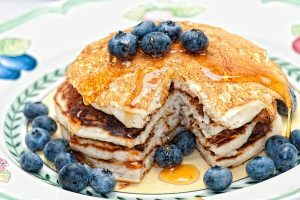 I found this to be cloyingly sweet (I know this isn’t your recipe), but would it be okay to cut down some on the sugar next time or will that affect the preservation? Also, all the solids seem to be at the top of the jars. As they are cooling right now, I am waiting until they’ve set a little more and then I am going to tip them back and forth some to distribute the solids. I assume that is okay?